Groups wishing use OIMB facilities should contact Laura Screen to make reservations. A 24–hour notice is necessary if you wish to cancel or reschedule your visit. All cancellations made within 24 hours of scheduled arrival date will be charged $20.00. On-campus housing: OIMB has dormitories that can house 50 people and has an additional eight family cottages, a four-unit apartment building, and a studio apartment. Demand is highest in the summers, so please inquire as far in advance as practical. 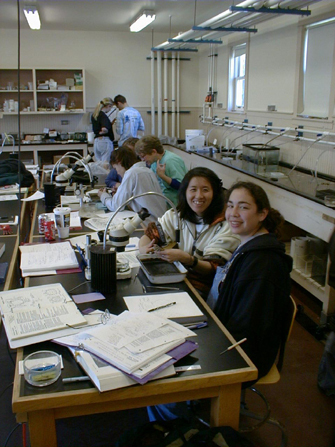 Teaching Laboratory: There are 5 teaching labs on campus that each accommodate 24 students and are equipped with sea tables and running sea water. Microscopes and projection equipment can be arranged. The R/V Pluteus: A 42-food aluminum hull trawler, which can be rented for class use. Teaching Opportunities: Classes in the OIMB summer session are taught by visiting faculty. Faculty who would be interested in teaching a course during the summer should contact Maya Watts to discuss this possibility.